Mercy Ministries is thrilled to announce that we have received a 4-star rating – the highest rating you can earn - from Charity Navigator, America’s premier charity evaluator. Mercy Ministries is committed to stewardship and excellence and thus, we are pleased to have this designation. We want to share a portion of the letter we recently received from Charity Navigator. “On behalf of the Charity Navigator, I wish to congratulate Mercy Ministries of America on achieving our coveted 4-star rating for sound fiscal management. Charity Navigator scores charities on a scale of 0 to 4 stars to help America's philanthropists make intelligent giving decisions and to differentiate truly effective organizations. Four stars means that our organization exceeds industry standards and out performs most charities within our area of influence. This rise in our rating is an exceptional feat, especially given the economic challenges many charities have had to face in the last year. We are continuing to make improvements and gain efficiencies at Mercy Ministries, and we will only be successful with your continued support in this area. We will not rest on our laurels with this great accomplishment, but work diligently to ensure we maintain this level of excellence as our standard going forward. 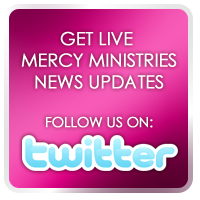 Thank you for your continued support of Mercy Ministries.